AUGUSTA, GA — Side-by-side vehicle enthusiasts can power into the new year and get more muscle for their money by jumping on Bad Boy Off Road’s Stampede Sales Event. This special event, which runs through Jan. 7, 2017, offers $1,000 off any new 80HP Stampede or Stampede XTR 4X4, plus 1.99 percent interest for 36 months. Find more details at www.badboyoffroad.com. Bad Boy Off Road is a brand of, and the Stampede is designed and manufactured by, Textron Specialized Vehicles Inc., a Textron Inc. (NYSE: TXT) company based in Augusta, Ga. The gas-powered Stampede and Stampede XTR are designed for both work and play, whether it’s doing chores on the farm, hunting a favorite spot or attacking a challenging trail. 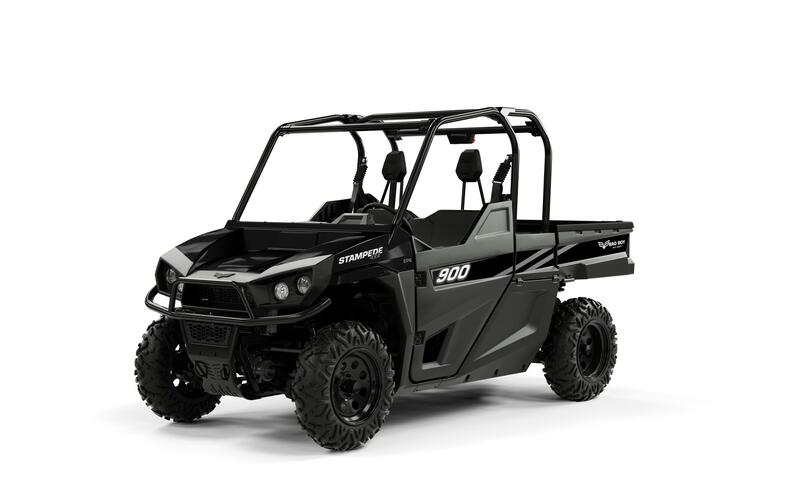 They dominate competitive side-by-side models with features such as a German-engineered, precision-tuned 846cc liquid-cooled 80HP EFI engine; an industry-first, customizable extended cab; and the most storage space in their class. Backed by a robust two-year warranty, the two-passenger Stampede and four-passenger Stampede XTR have over 70 custom-fit, purpose-built accessories to choose from. For more information, contact a local dealer, or go to www.badboystampede.com or www.badboystampedextr.com, which offer the opportunity to take a virtual test drive. Join the conversation on Facebook at Facebook.com/BadBoyOffRoad, on Twitter at @BadBoyOffRoad, and on Instagram at @BadBoyOffRoad. In addition to the Stampede Sales Event, Bad Boy Off Road is launching a Year of Savings Sales Event that offers up to $1,000 off its all-electric and hybrid side-by-sides: Recoil®, Recoil iS, Recoil iS Crew and Ambush® iS. Savings vary by model year. The Year of Savings Sales Event also ends Jan. 7, 2017. Get all the details at www.badboyoffroad.com. The Bad Boy brand pioneered the category of electrically powered 4x4 vehicles, ideal for hunting and outdoor recreation due to their silent, odorless operation and environmentally friendly, emissions-free drivetrains. Today, the diverse Bad Boy product line includes gas, electric, and hybrid-powered off-road vehicles for a variety of uses in work and play, including the new Stampede and Stampede XTR 4x4 side-by-sides. Bad Boy Off Road is a brand of Textron Specialized Vehicles Inc., a Textron Inc. (NYSE: TXT) company.